The Spanish A Class 2.018 Championship was held in Vigo (Galicia at the North of Spain) between the 6 and the 9 of September 2.018. A fleet of 21 boats was present during the event. Just 4 races were raced. 2 on Friday 7thfrom 8 to 12 knots and 2 on Saturday, first one with 4/6 knots and the other one from 8 to 12 knots. Sunday it was not possible to race due to bad weather conditions. 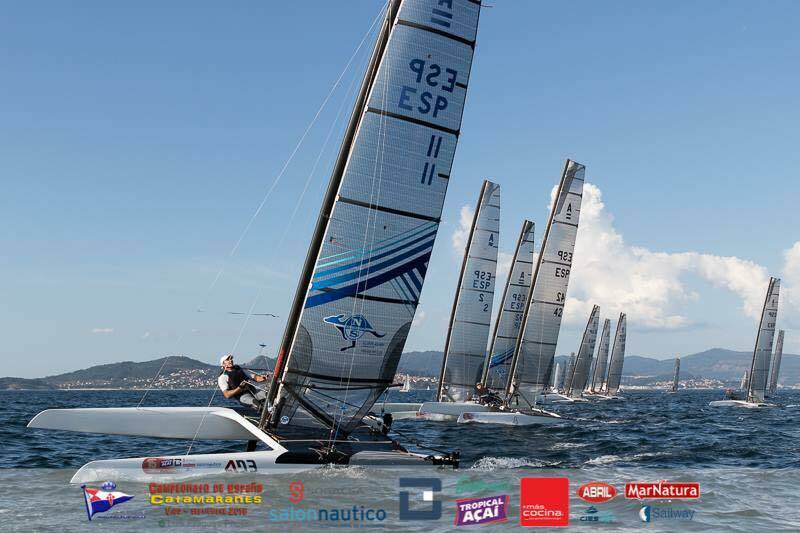 Friday, Manuel Calavia (ESP-11) dominated the fleet with two bullets and a big gap ahead Juan Luís Paez (ESP 19), Marc Verdaguer (ESP 16), Rafael Gómez (ESP 93) and Abdón Ibañez (ESP 74). 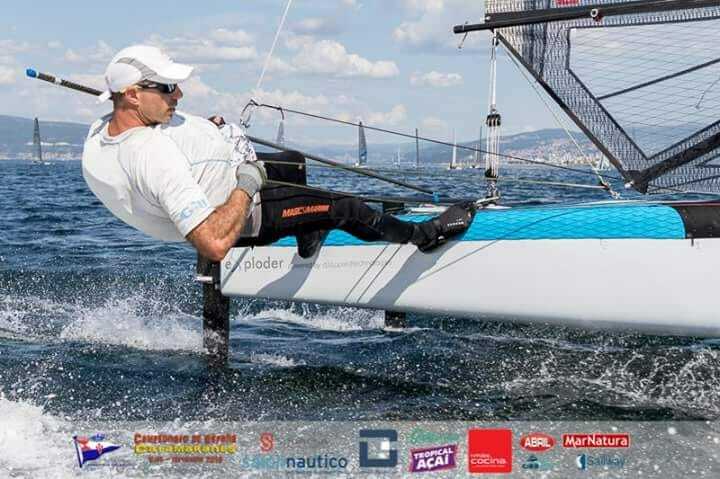 It is relevant to point that Juan Luís Paez, Marc Verdaguer and Rafael Gómez are new sailors in the class from last year and that they are pushing the level of the class in Spain. Saturday, first race was raced in 4/6 knots and the floaters were present on top. Santi Monjo (ESP 2) with 69 years old finished just 2º after Abdón Ibañez. Manuel Calavia made some mistakes and a penalty of 360 avoid him to fight for this race. 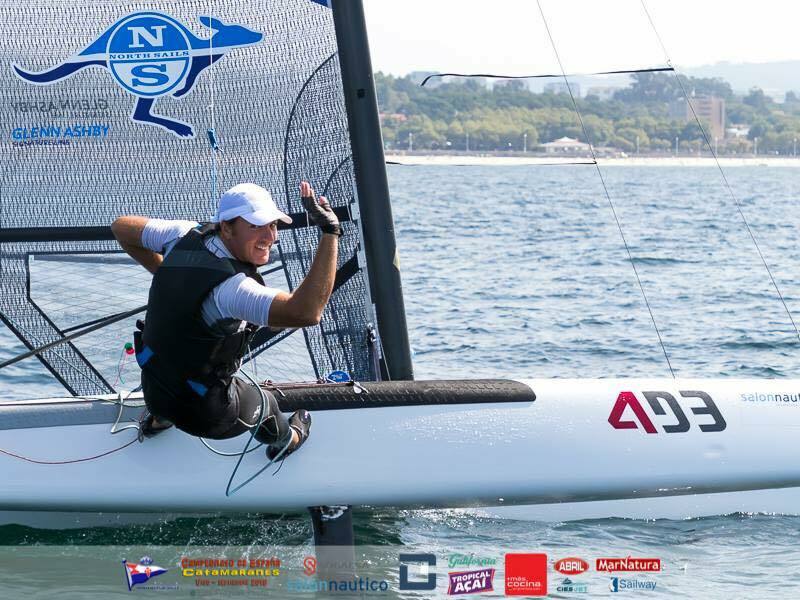 Second race was raced in 8/12 knots and Manuel Calavia dominated the race with big margin against Marc Verdaguer and Juan Luís Paez. 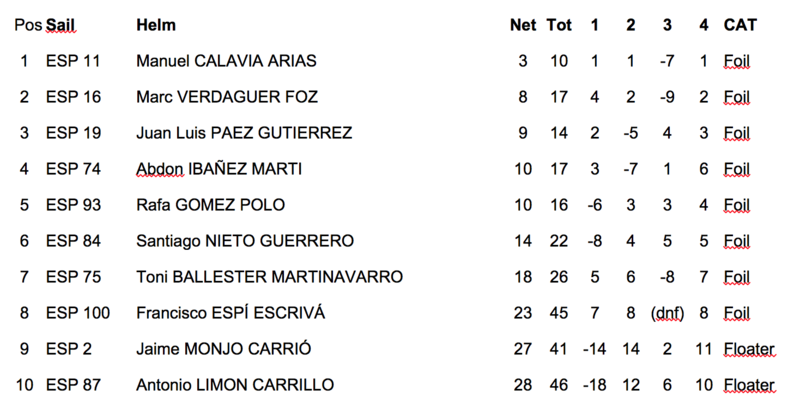 Manuel Calavia continues untouchable in Spain (at this regatta he used Anton Paz boat and mast borrowed by Anton) and new sailors like Marc Verdaguer and Juan Luís Paez are going up in the ranking. Finally, the floating fleet also had a different ranking. Enrique Cornejo (ESP-5) was crowned Spanish A Class Floating Champion, 2º was Santi Monjo (ESP-2) and Antonio Limón (ESP-87) was 3º.